NH Primary Night -- Governor Lynch, originally uploaded by marcn. 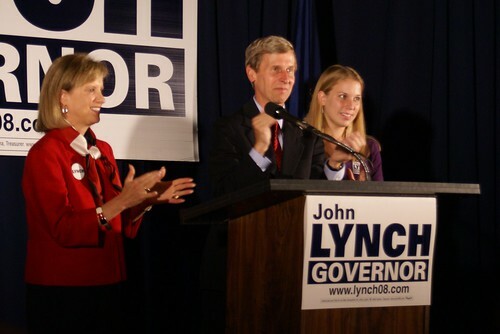 We took the kids up to Manchester to the John Lynch Re-Election post-primary celebration. Spencer talked to a number of NH State reps asking about what it takes to get started in politics. The "Second First Daughter of NH" did a fine job introducing her father. "Lynch, a Hopkinton resident, won with 35,333, or 90 percent, to 3,783, or 10 percent, for Forry with 78 percent of the vote reported."